Assad Ahmad Barakat is a U.S.-designated key Hezbollah financier who has operated in the Tri-Border Area (TBA) of South America––the region that straddles the borders of Paraguay, Brazil, and Argentina.“Treasury Designates Islamic Extremist, Two Companies Supporting Hizballah in Tri-Border Area,” U.S. Department of the Treasury, June 10, 2004, https://www.treasury.gov/press-center/press-releases/Pages/js1720.aspx. Barakat, who has close ties with Hezbollah’s leadership, was the group’s chief of military operations and fundraising in the TBA in the 1990s.“Terrorist and Organized Crime Groups in the Tri-Border Area (TBA) of South America,” Library of Congress, July 2003, 2, 20, https://www.loc.gov/rr/frd/pdf-files/TerrOrgCrime_TBA.pdf. He operated Hezbollah’s financial network in the region, and owned several businesses of his own that conducted money laundering activities to generate funds for the group.“Treasury Designates Islamic Extremist, Two Companies Supporting Hizballah in Tri-Border Area,” U.S. Department of the Treasury, June 10, 2004, https://www.treasury.gov/press-center/press-releases/Pages/js1720.aspx. Barakat was indicted by Paraguay in 2001, and served a six-and-a-half-year prison sentence in the country after he was arrested in Brazil in 2002.“Terrorist and Organized Crime Groups in the Tri-Border Area (TBA) of South America,” Library of Congress, July 2003, 2, 20, https://www.loc.gov/rr/frd/pdf-files/TerrOrgCrime_TBA.pdf; “Treasury Designates Islamic Extremist, Two Companies Supporting Hizballah in Tri-Border Area,” U.S. Department of the Treasury, June 10, 2004, https://www.treasury.gov/press-center/press-releases/Pages/js1720.aspx. He was released from Paraguayan custody in 2009.“The many criminal heads of the Golden Hydra,” Counter Extremism Project, accessed May 25, 2016, https://www.counterextremism.com/sites/default/files/The%20Many%20Criminal%20Heads%20of%20the%20Golden%20Hydra%20%28May%202018%29.pdf. He is wanted by Paraguayan authorities for identity theft and by Argentine authorities for money laundering on behalf of Hezbollah in an Argentine casino. In September 2018, Brazilian police arrested Barakat near the Paraguayan and Argentine borders.“‘Hezbollah treasurer’ Barakat arrested in Brazil border city,” BBC News, September 22, 2018, https://www.bbc.com/news/world-latin-america-45610738. In the mid-1980s, Barakat immigrated from Lebanon to Paraguay to escape the Lebanese Civil War.“Terrorist and Organized Crime Groups in the Tri-Border Area (TBA) of South America,” Library of Congress, July 2003, 2, 20, https://www.loc.gov/rr/frd/pdf-files/TerrOrgCrime_TBA.pdf; “The many criminal heads of the Golden Hydra,” Counter Extremism Project, accessed May 25, 2016, https://www.counterextremism.com/sites/default/files/The%20Many%20Criminal%20Heads%20of%20the%20Golden%20Hydra%20%28May%202018%29.pdf. He soon began operating several businesses based in Ciudad del Este, Paraguay, including Apollo Import Export and Mondial Engineering and Construction, through which he conducted money laundering schemes to generate funds for Hezbollah.“Terrorist and Organized Crime Groups in the Tri-Border Area (TBA) of South America,” Library of Congress, July 2003, 2, 20, https://www.loc.gov/rr/frd/pdf-files/TerrOrgCrime_TBA.pdf; “The many criminal heads of the Golden Hydra,” Counter Extremism Project, accessed May 25, 2016, https://www.counterextremism.com/sites/default/files/The%20Many%20Criminal%20Heads%20of%20the%20Golden%20Hydra%20%28May%202018%29.pdf; “Treasury Targets Hizballah Fundraising Network in the Triple Frontier of Argentina, Brazil, and Paraguay,” U.S. Department of the Treasury, December 6, 2006, https://www.treasury.gov/press-center/press-releases/Pages/hp190.aspx. Barakat also operated additional businesses based in Lebanon, Chile, and the United States, at times with the assistance of his brothers Hatem and Hamzi.“Terrorist and Organized Crime Groups in the Tri-Border Area (TBA) of South America,” Library of Congress, July 2003, 2, 20, https://www.loc.gov/rr/frd/pdf-files/TerrOrgCrime_TBA.pdf; “Treasury Designates Islamic Extremist, Two Companies Supporting Hizballah in Tri-Border Area,” U.S. Department of the Treasury, June 10, 2004, https://www.treasury.gov/press-center/press-releases/Pages/js1720.aspx; “Recent OFAC Actions,” U.S. Department of the Treasury, December 6, 2006, https://www.treasury.gov/resource-center/sanctions/OFAC-Enforcement/pages/20061206.aspx. He also collected funds for Hezbollah by pressuring Lebanese shopkeepers in the TBA to pay a quota to the group under threat of putting their family members on a “Hezbollah blacklist.”“Treasury Designates Islamic Extremist, Two Companies Supporting Hizballah in Tri-Border Area,” U.S. Department of the Treasury, June 10, 2004, https://www.treasury.gov/press-center/press-releases/Pages/js1720.aspx. 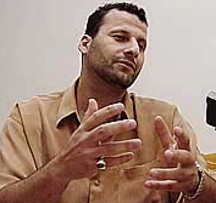 Barakat regularly sent large sums of money to the group in Lebanon and Iran and even personally carried funds to Lebanon, traveling with a Paraguayan passport as of 2000.“Treasury Designates Islamic Extremist, Two Companies Supporting Hizballah in Tri-Border Area,” U.S. Department of the Treasury, June 10, 2004, https://www.treasury.gov/press-center/press-releases/Pages/js1720.aspx; “Terrorist and Organized Crime Groups in the Tri-Border Area (TBA) of South America,” Library of Congress, July 2003, 2, 20, https://www.loc.gov/rr/frd/pdf-files/TerrOrgCrime_TBA.pdf. In addition to his direct fundraising roles, Barakat reportedly served as the deputy financial director of a mosque in Brazil, as the deputy for another Hezbollah financial official, Ali Muhammad Kazan, and eventually as the primary liaison in the TBA for Hezbollah’s Secretary General Hassan Nasrallah.“Treasury Designates Islamic Extremist, Two Companies Supporting Hizballah in Tri-Border Area,” U.S. Department of the Treasury, June 10, 2004, https://www.treasury.gov/press-center/press-releases/Pages/js1720.aspx. He was also reportedly one of two individuals in charge of distributing counterfeit U.S. currency in the TBA.“Treasury Designates Islamic Extremist, Two Companies Supporting Hizballah in Tri-Border Area,” U.S. Department of the Treasury, June 10, 2004, https://www.treasury.gov/press-center/press-releases/Pages/js1720.aspx. As of 2001, Barakat reportedly traveled to Lebanon and Iran annually to meet with Hezbollah’s leadership.“Treasury Designates Islamic Extremist, Two Companies Supporting Hizballah in Tri-Border Area,” U.S. Department of the Treasury, June 10, 2004, https://www.treasury.gov/press-center/press-releases/Pages/js1720.aspx. Barakat was also involved in planning Hezbollah’s military operations. He was an organizer and key financier of Hezbollah’s 1994 bombing of the AMIA Jewish community center in Buenos Aires that killed 85 people and injured over 300.“The many criminal heads of the Golden Hydra,” Counter Extremism Project, accessed May 25, 2016, https://www.counterextremism.com/sites/default/files/The%20Many%20Criminal%20Heads%20of%20the%20Golden%20Hydra%20%28May%202018%29.pdf; Harriet Alexander, “The Buenos Aires bomb, the Iranian allegations, and the accusations against Cristina Kirchner,” Telegraph (London), January 19, 2015, https://www.telegraph.co.uk/news/worldnews/southamerica/argentina/11356031/The-Buenos-Aires-bomb-the-Iranian-allegations-and-the-accusations-against-Cristina-Kirchner.html. Barakat relayed information to Hezbollah’s leadership about Arabs in the TBA who traveled to the United States or Israel. He regularly hosted and attended meetings with other senior Hezbollah leaders in the TBA, such as one meeting in Brazil in the fall of 2000 at which they discussed potential assassination plots. Authorities later discovered videos on Barakat’s personal computer of violent Hezbollah military operations in Lebanon.“Treasury Designates Islamic Extremist, Two Companies Supporting Hizballah in Tri-Border Area,” U.S. Department of the Treasury, June 10, 2004, https://www.treasury.gov/press-center/press-releases/Pages/js1720.aspx. In 2001, Paraguay indicted Barakat on charges of association, abetment of crime, and tax evasion, and an international warrant was issued for his arrest. In response, Barakat fled the TBA that October.“Terrorist and Organized Crime Groups in the Tri-Border Area (TBA) of South America,” Library of Congress, July 2003, 2, 20, https://www.loc.gov/rr/frd/pdf-files/TerrOrgCrime_TBA.pdf. However, he was arrested by Brazilian authorities in Foz do Iguaçu, Brazil, on June 22, 2002, and extradited to Paraguay that December, where he served a six and a half-year prison sentence.“Terrorist and Organized Crime Groups in the Tri-Border Area (TBA) of South America,” Library of Congress, July 2003, 2, 20, https://www.loc.gov/rr/frd/pdf-files/TerrOrgCrime_TBA.pdf; “Treasury Designates Islamic Extremist, Two Companies Supporting Hizballah in Tri-Border Area,” U.S. Department of the Treasury, June 10, 2004, https://www.treasury.gov/press-center/press-releases/Pages/js1720.aspx. Barakat was designated as a Specially Designated Global Terrorist by the U.S. Department of the Treasury on June 10, 2004. Two of his businesses, Casa Apollo and Barakat Import Export Ltda., were also designated at the time for their involvement in generating support for Hezbollah.“Treasury Designates Islamic Extremist, Two Companies Supporting Hizballah in Tri-Border Area,” U.S. Department of the Treasury, June 10, 2004, https://www.treasury.gov/press-center/press-releases/Pages/js1720.aspx. Barakat was released from Paraguayan custody in 2009, though Paraguay reportedly lost track of his whereabouts since.“The many criminal heads of the Golden Hydra,” Counter Extremism Project, accessed May 25, 2016, https://www.counterextremism.com/sites/default/files/The%20Many%20Criminal%20Heads%20of%20the%20Golden%20Hydra%20%28May%202018%29.pdf. According to the Brazilian Federal Police, Barakat continued to operate on behalf of Hezbollah in Argentina, Brazil, and Chile. Argentine police accused him of money laundering at a casino in the Argentine city of Puerto Iguazu. In August 2018, Brazil’s supreme court authorized Barakat’s arrest after Paraguay issued an arrest warrant. On September 21, 2018, Brazilian police announced they had arrested Barakat in Foz do Iguaco, Brazil, near the border with Paraguay and Argentina. It remains unclear whether or to where he may be extradited.“Brazilian police arrest alleged Hezbollah financier,” Reuters, September 21, 2018, https://www.reuters.com/article/us-brazil-hezbollah-arrest/brazilian-police-arrest-alleged-hezbollah-financier-idUSKCN1M128N; “‘Hezbollah treasurer’ Barakat arrested in Brazil border city,” BBC News, September 22, 2018, https://www.bbc.com/news/world-latin-america-45610738. Assaad Ahmad Barakat“Recent OFAC Actions,” U.S. Department of the Treasury, June 10, 2004, https://www.treasury.gov/resource-center/sanctions/OFAC-Enforcement/pages/20040610.aspx. Assad Ahmed Muhammad Barakat“Recent OFAC Actions,” U.S. Department of the Treasury, June 10, 2004, https://www.treasury.gov/resource-center/sanctions/OFAC-Enforcement/pages/20040610.aspx. Assad Hassan Barakat“Recent OFAC Actions,” U.S. Department of the Treasury, June 10, 2004, https://www.treasury.gov/resource-center/sanctions/OFAC-Enforcement/pages/20040610.aspx. Assad Barakat“Recent OFAC Actions,” U.S. Department of the Treasury, June 10, 2004, https://www.treasury.gov/resource-center/sanctions/OFAC-Enforcement/pages/20040610.aspx. Hajj As’ad Ahmad Barakat“Recent OFAC Actions,” U.S. Department of the Treasury, June 10, 2004, https://www.treasury.gov/resource-center/sanctions/OFAC-Enforcement/pages/20040610.aspx. Jach Assad Ahmad Barakat“Recent OFAC Actions,” U.S. Department of the Treasury, June 10, 2004, https://www.treasury.gov/resource-center/sanctions/OFAC-Enforcement/pages/20040610.aspx. The U.S. Department of the Treasury designated “Assad Ahmad Barakat” as a Specially Designated Global Terrorist pursuant to Executive Order (E.O.) 13224 on June 10, 2004.“Recent OFAC Actions,” U.S. Department of the Treasury, June 10, 2004, https://www.treasury.gov/resource-center/sanctions/OFAC-Enforcement/pages/20040610.aspx.